UAS OrthoImage monitoring a rockslide in DeBeque Canyon, Colorado, in March 2014. The U.S. Geological Survey (USGS) National Unmanned Aircraft Systems (UAS) Project Office utilizes UAS technology for collecting remote sensing data on a local scale. Typical UAS projects encompass areas that are difficult to reach or too expensive for traditional aircraft missions. The flexibility of operations and relative low cost of UAS allow scientists to support a range of activities including monitoring environmental conditions, analyzing the impacts of climate changes, responding to natural hazards, understanding landscape change rates and consequences, conducting fire assessments, tracking wildlife inventories, aiding search and rescue, and supporting related land management and emergency response missions. UAS raw data can be acquired in project areas that were previously too expensive or too dangerous to monitor. Geospatial products, such as orthophotography and Point Cloud data, can be generated from the raw data to meet the needs of the scientific research and public safety communities. The USGS is part of a collaborative team working across the Department of the Interior (DOI), Federal Aviation Administration, National Aeronautics and Space Administration, National Oceanic and Atmospheric Administration, U.S. Forest Service, academia, and private industry. 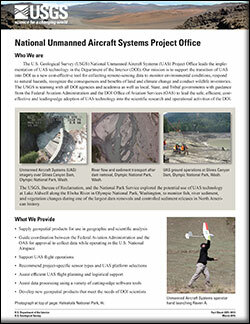 The National UAS Project Office website highlights the results of completed projects along with mission photos, posters, and publications. Examples of these projects include population surveys of nesting American White Pelicans at the Anaho Island National Wildlife Refuge, NV; vegetation mapping in difficult terrain and tule elk population estimates at Carrizo Plain Ecological Reserve, CA; documentation of exposed dinosaur tracks at the paleontological track site at White Sands National Monument, NM; and inspection of abandoned mine lands in Coal Basin, Pitkin County, CO. The USGS Earth Resources Observation and Science (EROS) Center manages and distributes data for the UAS Project Office, USGS Science Centers and other DOI bureaus. Type of data, format, file size, and resolution will vary by mission. Projects may include multiple missions over a range of dates. DSMs provide elevation values of landscape features on the earth's surface. This topographic product contains the height of the highest surface on the ground including vegetation, man-made structures, and bare earth. DTMs provide elevation values of the underlying terrain of the earth’s surface. This topographic product reflects the height of bare earth where the elevations of vegetation and man-made features have been removed. Coverage Maps indicating the availability of UAS Raw Photography products are available for download. Coverage Maps indicating the availability of UAS Orthoimagery products are available for download. Coverage Maps indicating the availability of UAS Point Cloud products are available for download. Coverage Maps indicating the availability of UAS DEMs products are available for download. EarthExplorer can be used to search, preview, and download UAS data. Raw, Ortho, Point Cloud, and DEM datasets are located under the UAS category. Goplen, Susan E.; Sloan, Jeff L.